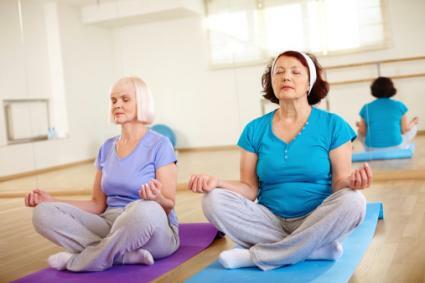 It's always helpful to perform easy yoga for arthritis if you suffer from the condition. Many people find great relief from their symptoms. WebMD defines arthritis as inflammation of the joint. Inflammation can be caused by a number of factors, and the result is swelling of the joint and surrounding tissues, stiffness, and pain. Unfortunately, arthritis can't be cured, but it can be managed through a combination of diet, exercise, and in more severe cases, medication. There are few studies exploring the impact of yoga on arthritis, but those available indicate that relief from symptoms and possible success in reducing inflammation may be the result of a combination of a balanced diet and yoga. Some people purport that eliminating dairy and nightshade plants from their diets and increasing intake of foods rich in omega-3 helps keep inflammation low. Here are some recipes designed in this manner. WebMD also outlines common arthritis diet and supplement information. Many believe yoga promotes better joint health in people who suffer from arthritis. Gentle movement actually makes them feel better, not worse. 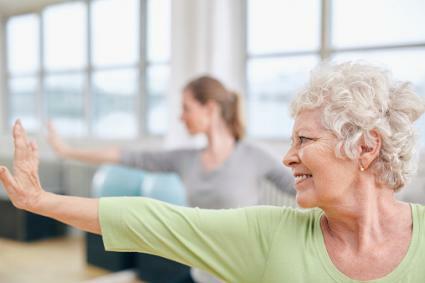 The Johns Hopkins Arthritis Center also suggests that easy yoga for arthritis practiced regularly enables someone to move on to other forms of exercise, such as water aerobics, tai chi, and walking. There are many psychological benefits as well. When people take control of managing arthritis, rather than letting it consume them, this attitude helps to create a better sense of wellbeing. Knowing that you can complete a 20- or 30-minute yoga routine and recognizing how much better you feel afterwards may encourage you to approach your day differently. Stress also plays a part in aggravating inflammation. For many, practicing yoga helps to reduce the impact of stress. Easy yoga for arthritis is available in stages. Some people may have only mild joint discomfort, so some traditional postures may be accessible to them as outlined or slightly modified. Other practitioners may need assistance from yoga equipment such as a block, strap, or bolster. Still others may find it easier to perform yoga with the use of a chair. It is always advised in yoga to respect your body and approach the edge of a pose with safety in mind. Remember, regular practice will benefit you more than pushing too hard when you don't need to. Often weight-bearing postures are more difficult for someone who suffers from hand, knee, and hip pain, so consider these modifications. Downward Facing Dog Pose - Flatten the hands, extending into each fingertip, to reduce pressure in the wrists. Sometimes a rolled mat or a sponge ball cut in half and placed under the wrists works well, too. Instead of straightening the knee, lift the hips but bend the knees as much as necessary for full support. Warrior Series - Shortening your stance may reduce pain in the knee, so consider that as one modification. In Warrior I, take time to square off the hips completely to one side. For example, if you start the pose on the right, shorten your stance and focus the hip bones completely to the right, then bend the right knee as far as is comfortable. You may have to angle the left, or back, foot in more to accomplish this. Forward Bend - The purpose of this pose is to open the back and elongate the hamstrings, so bending the knees as much as needed so the chest can rest on the thighs and opening the feet hip-distance apart will help you gain the benefits of this posture without discomfort. Seated Forward Bend - Again, we're opening the back, so place a block under the knees to allow your forward fold over the thighs to be more accessible without hyper-extending the knee. If you can't extend your hands to your feet, simply place them on your leg wherever is comfortable. Legs-Up-Against-the Wall - Such a great pose for increasing circulation. As you place your buttocks against the wall, simply put a pillow under the hips to alleviate any pressure. Supine Twists - Bring your right knee to your chest, then place your right ankle on your left thigh. Twist your right knee to the left, arms extended out to either side, neck rotated to the right. Support your right knee with a couple of stacked pillows if necessary. Switch sides. This pose helps to open the hip joints. Child's Pose - Place a pillow between your buttocks and heels to make sitting in this posture easier. Cobra Pose - Many people try to come up too far, increasing pressure on the wrists and in the low back. Keep your gaze forward, drop the shoulders, and only come up off the floor a little bit. Seated Twists - If your shoulders make it difficult to place an elbow on the outside of the raised knee in Seated Spinal Twist, don't worry. Simply extend the arm down the leg. In a crossed-legged twist, place blocks under the knees for support. Find images and further instruction about these poses in Yoga Journal. Using a chair as a prop or actually performing postures in a chair greatly reduces stress on the joints. You also have a certainty in your practice because you trust that your knee won't suddenly "give way." You can perform many standard yoga postures in a chair, including the Sun Salutation Sequence! LoveToKnow Yoga features two instructors who have created helpful chair routines, and we encourage you to read what they have to say and to try their DVDs. There are a number of books and DVDs to help people with arthritis practice yoga. Here are just a few. Yoga for Arthritis: The Complete Guide by Dr. Loren Fishman and yoga instructor Ellen Saltonstall. This book details areas affected by arthritis and postures designed to help those locations. The authors worked with noted instructor B.K.S. Iyengar to develop restorative poses. Mayo Clinic Wellness Solutions for Arthritis. This DVD focuses on managing the condition through proper diet and simple yoga routines created by Rodney Yee. Yoga for the Rest of Us by Peggy Cappy. She includes a number of pose modifications to help make practice more accessible.